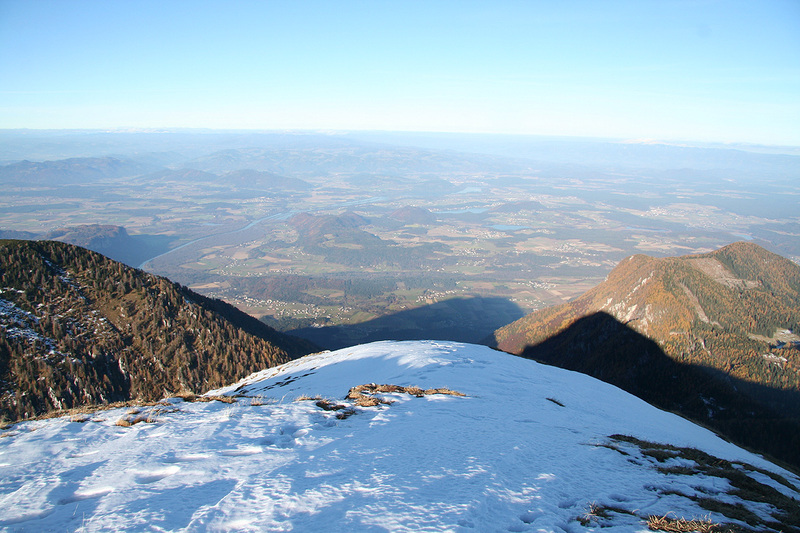 Location: South-East of Klagenfurt, Austria (near Slovenia). 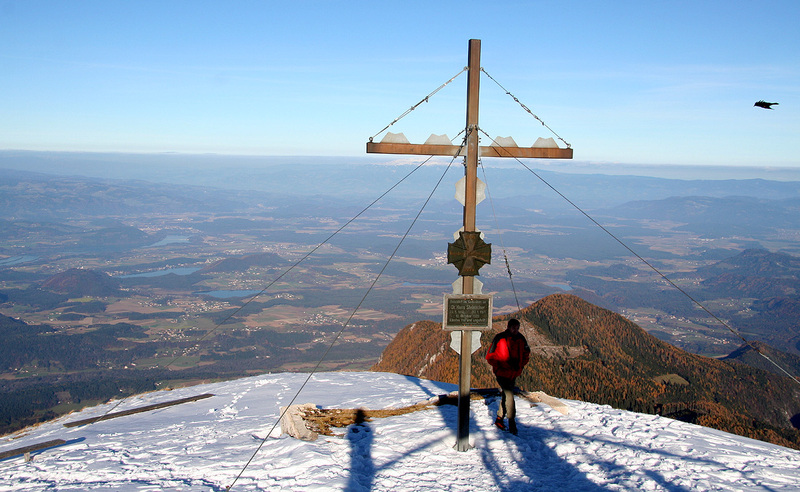 How to get there: This mountain is located south-east of Klagenfurt. Locate Hwy. 85 going east-west south of Klagenfurt and Hwy. 82 going north-south, east of Klagenfurt. These two roads meet in a T-junction. 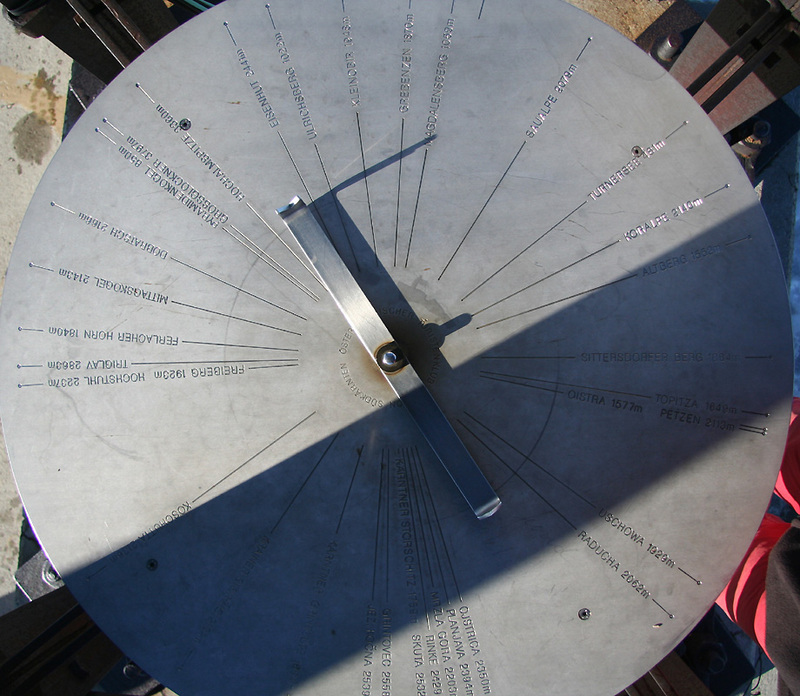 Find your way there and measure from this junction. Continue south on Hwy. 82, at kilometer 6.4, you enter Bad Eisenkappel, make a right. Shortly, at kilometer 6.6, there is a traffic circle where you also go right. Turn right onto a new and smaller road at kilometer 9.3. This road climbs the hillside among small farms. 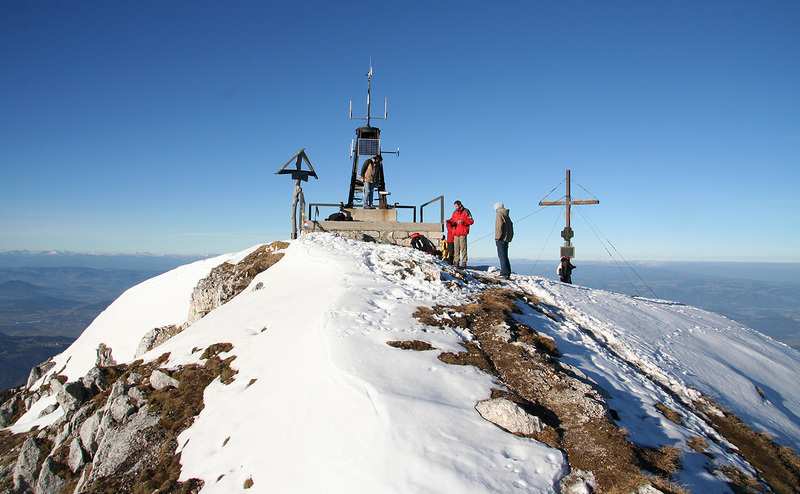 At kilometer 14.4, make a sharp right turn onto the small road that serves the Eisenkappler Hütte. There are signs here. At kilometer 15.7, the road curves left and there is a gate (that might be closed in winter). In summer, they may collect toll here. 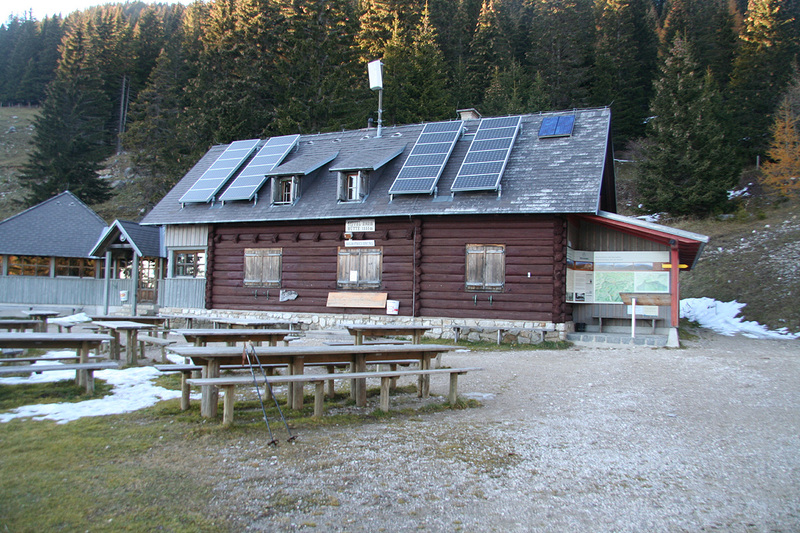 Continue uphill to the parking area at the Eisenkappler Hütte at kilometer 22.4. This is the trailhead, location N46:30.099, E014:30.693, elevation 1553 meter. Route description: The trail heads uphill on the right side of the hut (as seen when facing uphill). There are yellow signs giving the direction. 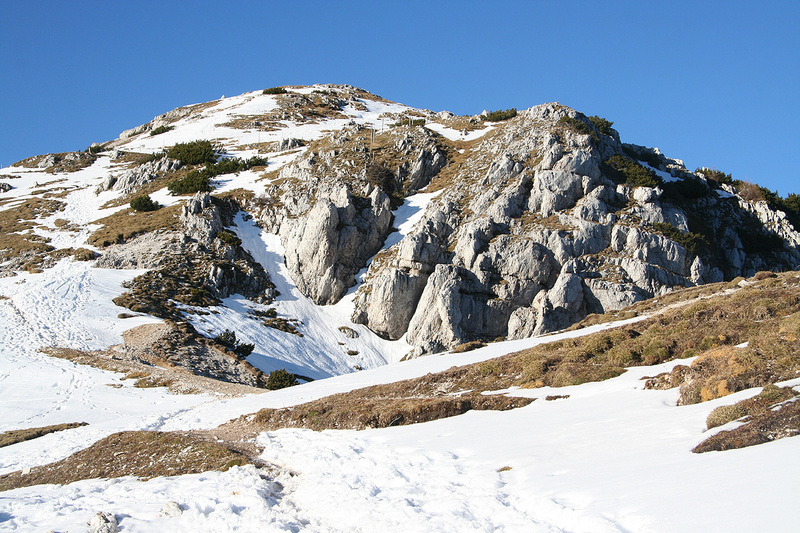 The trail is marked with the usual white and red paint. The trail first zig-zags uphill through the forest, then emerges on a shoulder from where you can see the summit higher up. The trail climbs gently across the obvious ridge, contours a little around the left side of the last top before the main summit, then ascends to a local saddle, before going more right to the summit of Hochobir. 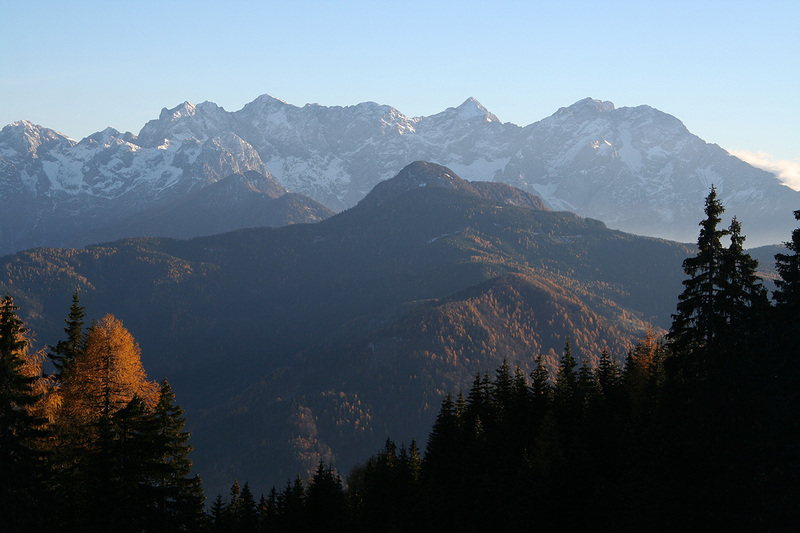 Comments: As I drove south after my nice, but foggy morning on Ameringkogel, the weather improved considerably. By the time I was approaching Bad Eisenkappel, there was blue sky everywhere. Still, several hours before it would get dark, I decided to explore the road to the trailhead and possibly moving tomorrows climb to an afternoon excursion. The road had signs saying it was closed for the winter, but the gate was open and the road could be driven all the way up to the parking. The parking area had a considerable number of cars, obviously this was a popular destination. Many people had taken this, possibly last opportunity of the season to climb Hochobir. I started out at 1345 and made the summit in slightly less than one hour by 1445. A very nice top where a stop to just look around seemed well deserved. Grintovec to the south seemed close and looked very impressive. 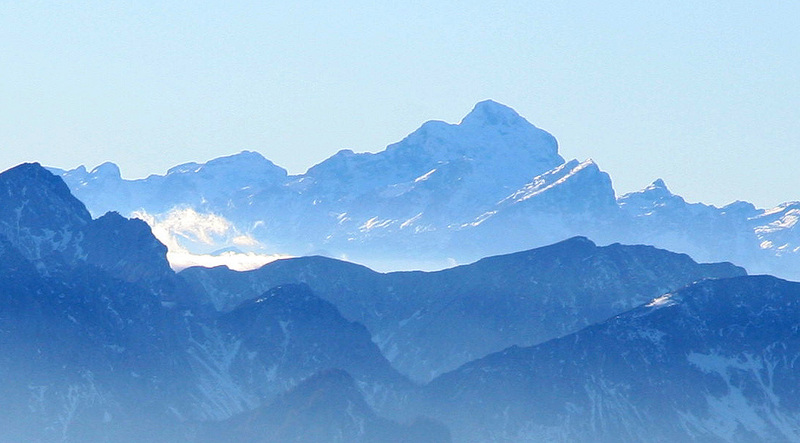 Triglav, now to the west, similarly reminded me of how close to Slovenia this summit is located. 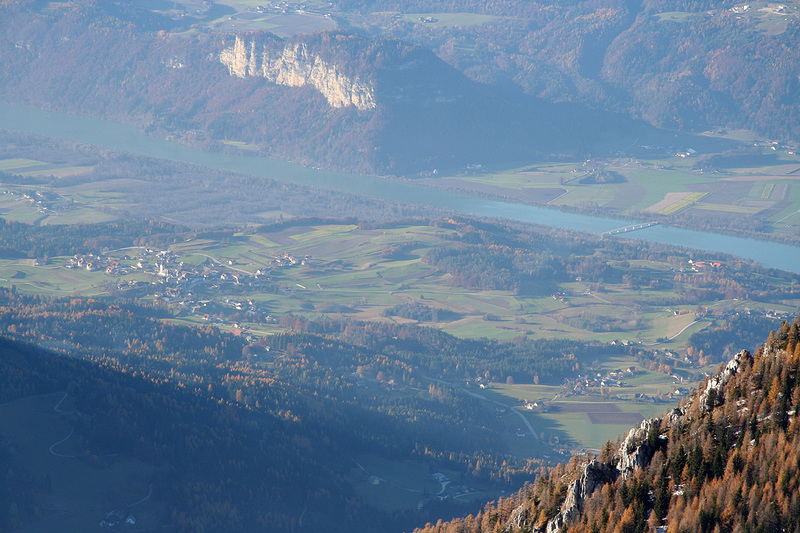 The river Drau, far below, making its way eastward as the landscape really opens up. I stayed around for 20 minutes before heading downslope, reaching the car at 1540. The last rays of sun was hitting Grintovec, it would soon be dark and I needed to make some new plans. This peak had been scheduled for tomorrow. Now, I needed a new objective on my way home to Linz. After a quick consultation with the map, I decided to drive towards Mirnock and make this mountain the last goal of the weekend. 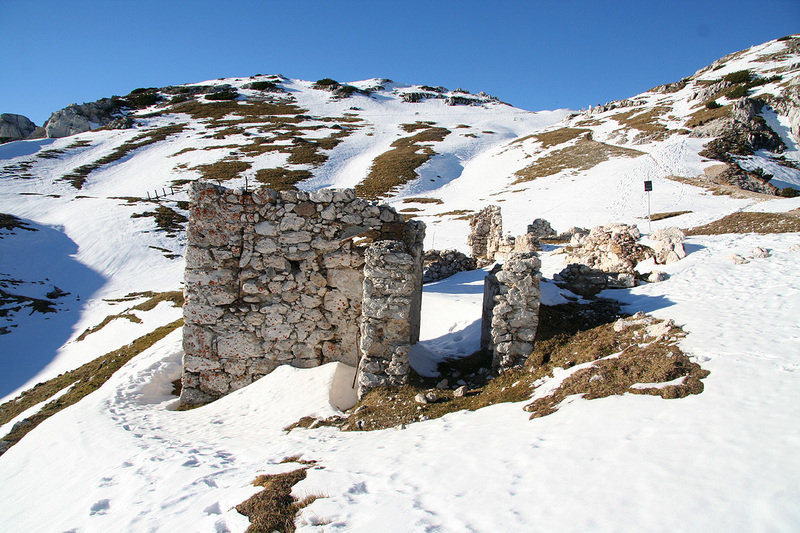 Old ruins near the summit of Hochobir. 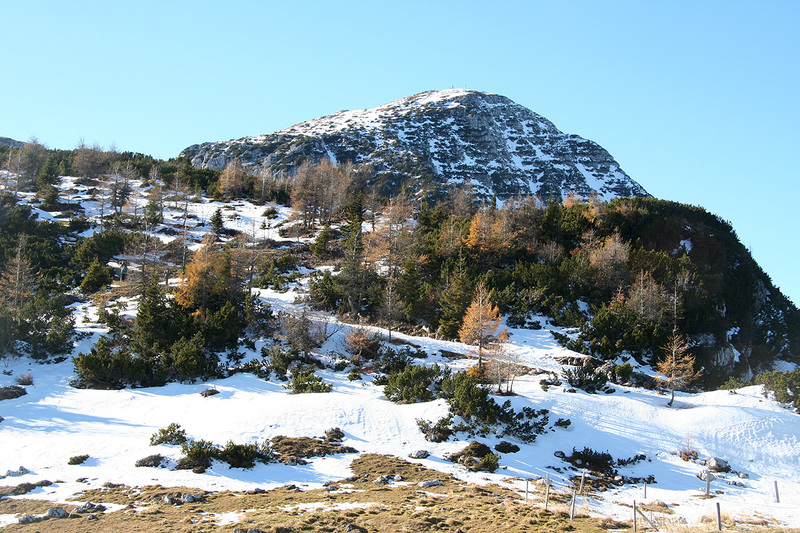 Grintovec, an ultra prominent mountain in Slovenia. Panorama I, south-east to south. Panorama II, south towards west.